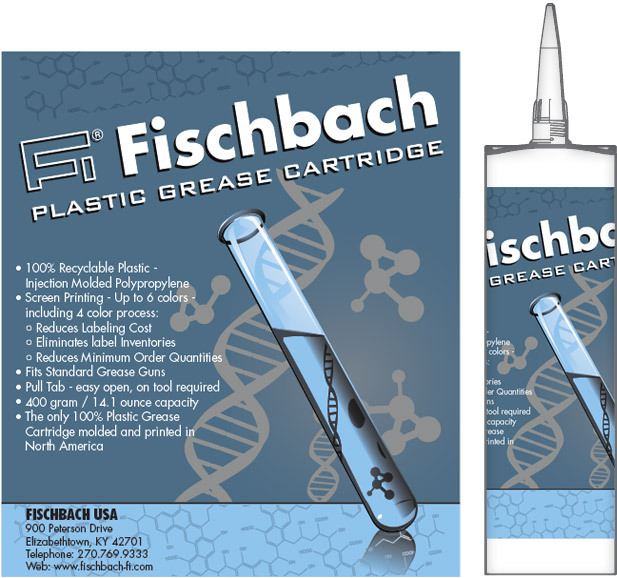 Fischbach, with a plant right here in Kentucky, is far and away the world’s leading producer of sealant packaging. Whether for industrial use or in the home, Fischbach has the market cornered when it comes to tubes for caulk and other sealants. While I was working in house on the graphic design team, the company trusted me with creating this packaging graphic design. I conceived this screen-printed layout to promote the company’s newest Grease Cartridge product. Whenever my employer had a special design project like this, they showed complete confidence in me. I say this because they gave me free reign to work solo over the concept. They handed me very few guidelines for this packaging graphic design. We showcased the most complex art and advanced printing techniques on these caulking tubes. Therefore, they were sent out as samples to prospective clients. When I read the phrase “100% Recyclable Plastic – Injection Molded Polypropylene”, a light bulb went off in my head. It inspired me to create the chemical formula and test tube theme you see here. First, I began by laying out a silver metal flake base. All of the blue, black, and white inks in the design overprint it. Because of this, the entire piece has a shiny and futuristic look throughout. The bullet points emblazoned on the cartridge overprinted in white detail each of the new part’s features. Finally, the DNA strands reverse out of the design. This makes them shine through with the bare silver finish. The final result is a perfect marriage of art and science concepts my that employers and their clientele loved. Does your business sell food items, tools, or gadgets for the home or workplace? No matter what industry you are in, I have the skills to make your packaging stand out. Contact me today to make your vision into a reality.